PT Tambang Batubara Bukit Asam Tbk - PTBA or referred to as "PT Bukit Asam Tbk" is a leading public-listed company in Indonesia, running business in coal mining industry. Based in Tanjung Enim South Sumatera, PTBA is widely known nationwide as one of the largest coal mining companies in Indonesia with 7.29 billion tons of total resources and 1.99 billion tons of total mine-able reserves. 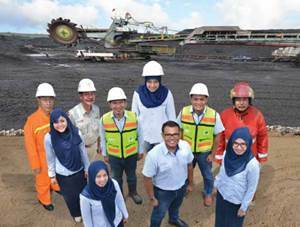 PTBA maintains approximately 90,832 hectares of mining business license (IUP), comprise of Tanjung Enim Coal Mine (66,414 hectares), Ombilim Coal Mine (2,950 hectares), Peranap Mine (18,230 hectares), and IPC mine (3,238 hectares). PTBA is a member of state-owned mining holding company PT Indonesia Asahan Alumuninum (Persero) or INALUM Group. As of December 2017, Bukit Asam is 65.02% owned by INALUM Group and 34.98% by general public and investors. PTBA now has 11 subsidiariy/affiliated companies; PT Batubara Bukit Kendi, PT Bukit Pembangkit Innovative, PT Bukit Asam Prima, PT Internasional Prima Coal, PT Bukit Asam Banko, PT Bukit Asam Transpacific Railways, PT Huadian Bukit Asam Power, PT Bukit Asam Methana Enim, PT Bukit Asam Metana Ombilin, PT Bukin Asam Metana Peranap and PT Bukit Milti Investama. In term of financial performance, PTBA recorded a satisfying financial result in 2016. According to PT Tambang Batubara Bukit Asam Tbk Annual Report 2016 as cited by JobsCDC.com, PTBA succeeded to chalk up a revenue figure of Rp14,058.87 billion. This number grew at 1.54% from Rp13,845.2 billion in the previous year (2015). PTBA’s total operating profit in 2016 also surged as much as 2.51% when compared to the previous year, from Rp2,468.90 billion in 2015 to Rp2,530.81 billion in 2016. Minimum Bachelor Degree (S1) in Finance, Accounting, Business with minimum GPA of 3.00. Master Degree (S2) in Finance is preferred. Required experience for minimum 3 years in handling financial model and feasibility study for new business development and merger/acquisition. Required experience for minimum 2 years in handling project financing/business development. Advanced knowledge in business scheme/model, financial model and analysis (preferable in the area of mining, power plant and infrastructure), prerequisites for feasibility studies of new business and acquisition, and national/international financing. The candidates with prior experience in financial consultant is preferred. Possess certification in relevant financial analyst is preferred. Required experience for minimum 5 years in relevant field. JobsCDC.com now available on android device. Download now on Google Play here. Please be aware of recruitment fraud. The entire stage of this selection process is free of charge. PT Bukit Asam Tbk - Professional Hire Program PTBA INALUM Group March 2018 will never ask for fees or upfront payments for any purposes during the recruitment process such as transportation and accommodation.